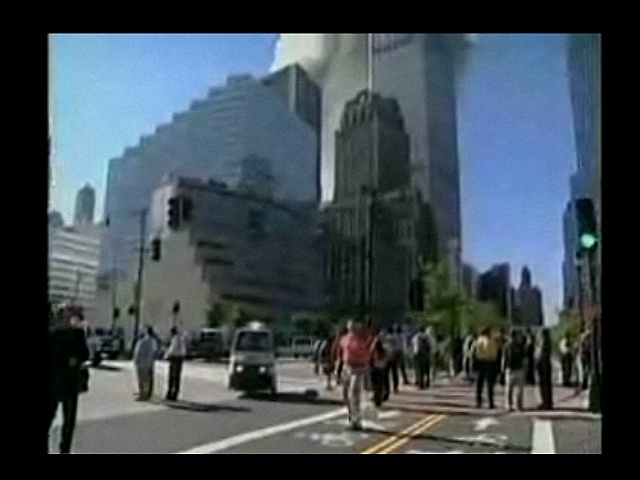 This is how the story goes: In 2006, "Peter Strid"(an anonymous entity) releases a video on the web which he claims to have filmed from underneath the WTC (on the Northwest side). He apparently captured a glimpse of the "2nd airplane", after which he rejoined his girlfriend in his apartment nearby. But let's assume this extraordinary coincidence is true. 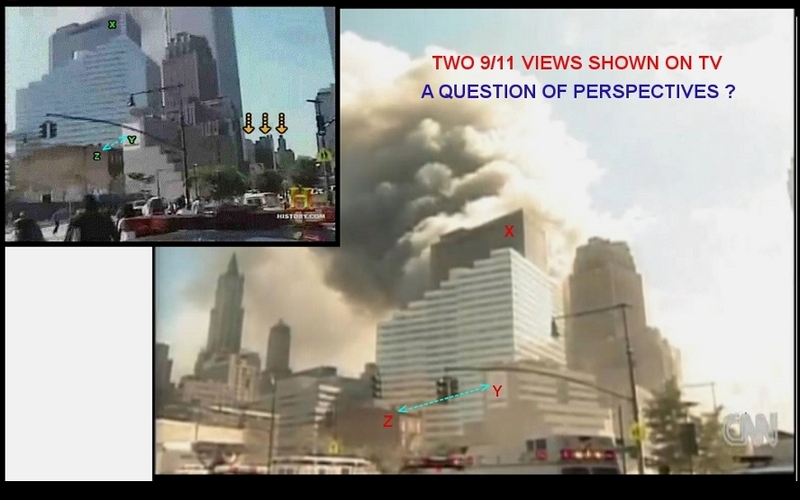 The fact is that, in 2002, the French Naudet brothers released a feature movie containing the picture at left which I have called "PERSPECTIVE C". 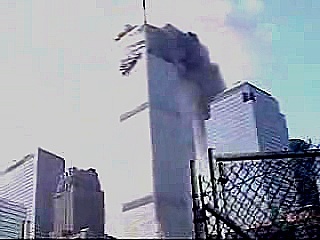 Then, in 2007, a man called Steven Rosenbaum released another 9/11 tribute film which contained the picture I have called "PERSPECTIVE D". 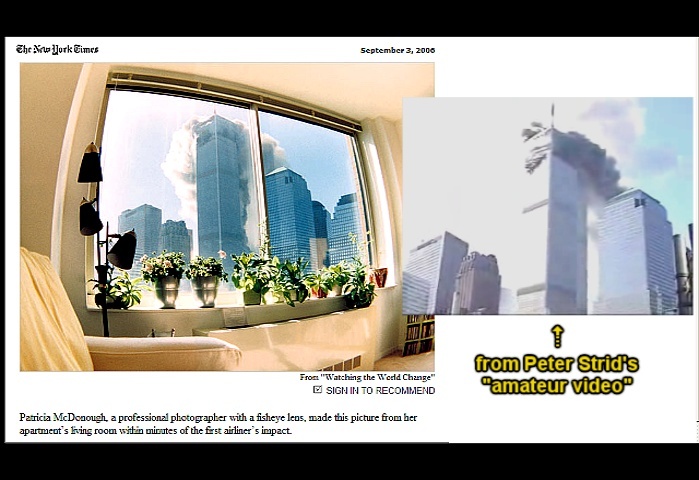 But there's more ... here's the icing on the cake: According to the New York Times, this is the picture of Patricia Mc Donough, "a pro-photographer with a fisheye lens who made this picture from her apartment's living room within minutes of the first airliner's impact." Anyone with a basic understanding of modern computer imagery will realize that all these tower shots are nothing else than an 'assembly line' of a single 'matrix' - rotated, twisted and colored at leisure. 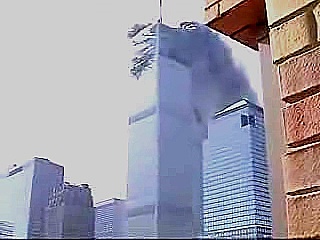 Thanks to Peter Strid, the Naudet brothers, Steven Rosenbaum, Israeli TV, Mike Cunga, CNN and Patricia Mc Donough for letting me use these unique documents of September 11, 2001 - even though none of you captured this imagery. It 's all computer graphics. PLEASE NOTE MISSING LAMPPOST IN THE MIDDLE OF FIRST PICTURE - AND BUILDINGS ON FAR LEFT. And yes, what you see above is the actual image texture featured on the 'serious' History Channel ! HISTORY CHANNEL versus CNN: what on Earth is going on here?! please go to the ongoing research thread SIMCITY 911 at Cluesforum.info.